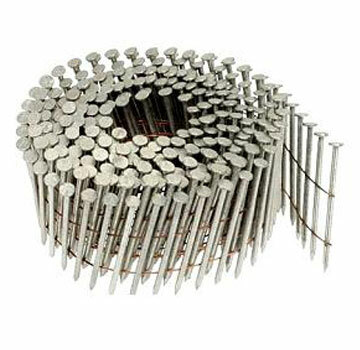 PRODUCT: 2-3/8" x .113" COIL FRAMING NAIL, ELECTRO-GALVANIZED RING SHANK, 15 DEGREE WIRE COLLATED, DIAMOND POINT. 5000/BOX, PRICE/BOX. APPLICATIONS: Framing, Sheathing, Decking, Siding.